Compact & portable- perfect for your RV, boat, or Small kitchen, this ice maker is compact, bars, restaurants, portable and works anywhere there is an outlet available; beautiful finish- this attractive ice maker will more than meet your ice making needs; no installation required - just plug in unit, add water and enjoy a batch of ice in as little as 6 minutes;;ice production- able to make up to 26 lbs. In 24 hours of bullet ice cubes per day, you'll never have to deal with pesky ice trays ever again;;insulated storage bin- the integrated storage bin is well-insulated and is able to hold 1.5 lbs. Of ice at a time; have ice fast- you can create ready-to-serve ice in an average of 6 minutes;;easy-to-use controls- turn this ice maker on/off and choose your ice size using this easy-to-use control panel; easy monitoring- able to see through window allow for process monitoring & ice level checking; light indicator- when the water level in the reservoir runs low, be alerted to add more water. 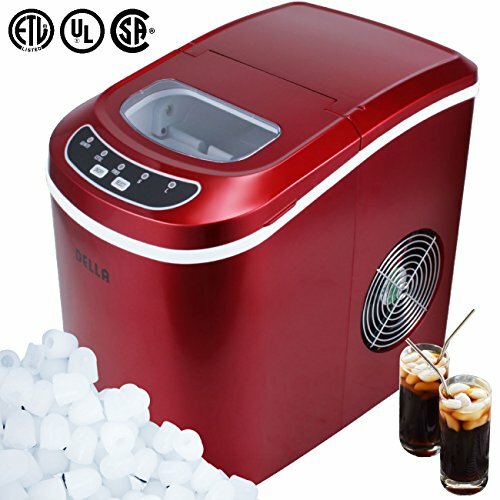 When the ice bucket is full, be alerted to remove them so more ice could be created specifications:;Frequency: 60 hz; voltage: 115 volts;;watts: 230 watts;;full ice basket indicator: yes; add water indicator: yes; automatic overflow protection: yes; operating cycle: 6 minutes;;ice making Capacity per cycle: 9 pieces;;daily ice making Capacity: 26 pounds;;refrigerant: R134a 2.25oz/64g;design pressure high/max: 290 design pressure low/Min: 88 type: portable ice makers;;ice shape: bullet; ice making current: 1.5A;ice Harvest current: 2.0A;water reservoir: 2.3 quart; certifications: ETL, CSA, UL listed;;Overall dimension: 14-1/2"(L) x 9-3/4"(w) x 12-3/4"(h)includes:;countertop ice makers;;ice scoop; user manual/p.